How often do I need to pack the the front bearings(2wd) and how big of a job is it to pull the hubs off? I'm looking forward (NOT) to doing the same thing. I'm not sure of mileage to do this job - but if you are going to do pads - it would seem to me that this is the ideal time. Instal brgs. TAP IN NEW SEAL VEWY,VEWY CAREFULY - instal on spindal - hook up caliper. Sounds so gosh darn simple !!!! It ain't broke, but I'm fixin it 'till IT IS!! "Wet"7710lbs. pulling 2004 Cougar 295EFS 9900 lbs. YIKES - my wife can put more clothes in? Inside - Barry, Margy, & Zeah the wonder dog. "Too soon ve get olde - und too late shmart". Ha, Ha, Ha - SoCaps member - go figure? My Scheduled Maintenance Guide say every 30,000 miles you should "Inspect/adjust 4x2 wheel bearings for end play." It seems sorta silly to go to that much trouble and not repack the bearings while you're in there. [img]/ubbthreads/images/graemlins/shrug.gif[/img] But nowhere does it mention the actual repacking of the wheel bearings. However, my dealer is a little more plain-spoken. His scheduled maintenance guide for PSDs says every 35,000 miles to "Inspect and re-pack front wheel bearings 2WD. $60.75". Remove the front disc brake caliper and rotor, and position the caliper out of the way. Remove the hub cap from the hub assembly. Remove the cotter pin, adjusting nut and flatwasher. NOTE: Inspect the condition of the spindle and nut threads to ensure a free turning nut when reassembling. Remove the outer bearing cone and roller assembly, and pull the hub assembly from the spindle. Using care not to damage the bearing cage, use a suitable slide hammer and bearing seal remover to remove the inner bearing cone and bearing seal. CAUTION: Do not spin the bearing dry with compressed air. NOTE: Remove all traces of lubricant from the bearings, hub and axle spindle. Inspect bearings and bearing cups for pitting, spalling or unusual wear. If either bearings or bearing cups are worn or damaged, replace both bearings and bearing cups. NOTE: It is recommended that bearings and bearing cups be replaced in sets. If cups are worn or damaged, install the inner and outer bearing cups in the hub with an appropriate bearing cup driver tool. Check for proper seating of new bearing cups by trying to insert a 0.38-mm (0.0015-inch) feeler gauge between the bottom face of the cup and wheel hub seat. You should not be able to insert the feeler gauge. Remove all burrs, nicks or scratches from the shoulder of the spindle and seal bore in the hub with emery cloth. Pack the inside of the hub with lithium-base wheel bearing grease such as Motorcraft Premium Long-Life Grease XG-1-C or -K or equivalent meeting Ford specification ESA-M1C75-B. 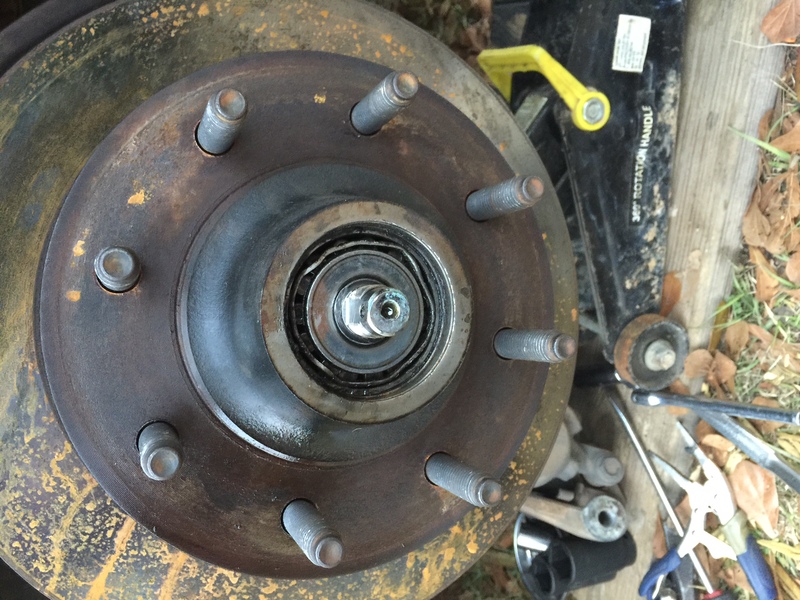 Fill the hub until the grease is flush with the inside diameters of both bearing cups. Pack the bearing cone and roller assemblies with wheel bearing grease. Use a bearing packer for this operation. If a packer is not available, work as much lubricant as possible between the rollers and cages. CAUTION: Keep the hub centered on the spindle to prevent damage to the grease seal or spindle threads. Place the inner bearing cone and roller assembly in the inner cup and install the wheel bearing hub seal, using a suitable seal replacer. Make sure seal is fully seated and lubricated. CAUTION: Wheel seals on the front axles must be replaced any time the axle lubricants are changed from factory-installed mineral lube to synthetic lube or vice versa. CAUTION: If bearings are adjusted too tightly, they will overheat and wear rapidly. An adjustment that is excessively loose can cause pounding and contribute to uneven tire wear, steering difficulties and inefficient brakes. Check bearing adjustment at regular inspection intervals. New wheel seals must be installed when the hub is removed. A damaged or worn seal can permit bearing lubricant to reach the brake linings, resulting in ineffective brake operation and necessitating premature replacement of linings. To check the wheel bearing adjustment, raise the front of the vehicle. Grasp the tire at the sides, and alternately push inward and pull outward on the tire. If any looseness is felt, adjust the front wheel bearings as follows. While rotating the wheel, tighten the adjusting nut to 21 lb/ft to seat the bearings. Back off the adjusting nut until loose. While rotating the wheel, tighten the adjusting nut 120 to 180 degrees. Torque required to rotate the hub should be 2 Nm (18 lb-in). Install the castellated nut and insert a new cotter pin. Install the front disc brake caliper and rotor. For additional information, refer to Section 206-03 . Install the front wheel and tire assemblies. Instead of a new post, I'll try to revive this one. Your sure this is a 2wd? Have you taken the brake caliper off? There is nothing to rust on. The only thing that might hang would be the seal, but a gentle tug should overcome that. Did the bearings disintegrate? Did the outer bearing come out yet? Thanks for the response. This is a two wheel drive (although I wish otherwise sometimes) and the brake caliper is removed. It appears that the outer bearing has somehow seized to the spindle. Placing a large socket on the outer bearing surface and tapping makes the situation worse so I'm assuming that this bearing is the issue. That's what is going to have to happen. That outer bearing has to come out first. Your going to have to get aggressive with this. I consider accept the spindle is destroyed, so you might be ok with taking a torch to it. Was able to take a Dremel and cut the bearing down to remove the outer bearing in pieces, This allowed be to remove the hub and inner bearing and then hammer the remaining bit of the out bearing off, saving the spindle. Need to grease the other side next week. Hope there ain't a repeat. I have a 2007 F350 RWD, owners manual says to replace front wheel bearings at 120,000 miles. Is this an arbitrary item or can I just inspect and reinstall? You could, but they’re so cheap why not just start fresh? Order Timken bearings on Rockauto along with the inner seal. Might even order a set of brake pads as well. I’d also get the caliper pin boots. Clean, polish, and relube the caliper pins while you’re there.